This review first appeared in the April 30, 1993 issue of the North County Blade-Citizen (now North County Times). 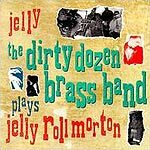 The Dirty Dozen Brass Band has dedicated its sixth album to the songs of one of the founders of jazz, Jelly Roll Morton. But it's Jelly Roll as only the Dirty Dozen could play him, which means loud, sassy and contemporary, perhaps the way Jelly Roll would play if he were still around. Danny Barker, the octogenarian banjo player and general New Orleans encyclopedia, shows up here, too, sharing his reminiscences of MOrton, whom he met over a half century ago. It's a rewarding juxtaposition, these earliest (almost forgotten) jazz compositions, played in modern arrangements by one of the hippest young jazz bands around.